(TibetanReview.net, Jan15’19) – Chinese authorities in Tibet Autonomous Region (TAR) investigated and tried 25 cases involving 25 people for having allegedly incited separatism or financed others to jeopardize national security during the past one year, reported the official globaltimes.cn Jan 13, citing a report from the regional court. China labels most of the Tibetan and Tibet related entities, including religious centres, and individuals set up or living abroad as part of what it calls the “Dalai clique”. Hence it considers making religious offerings to such recipients abroad by local Tibetans as financing of others to jeopardize national security. 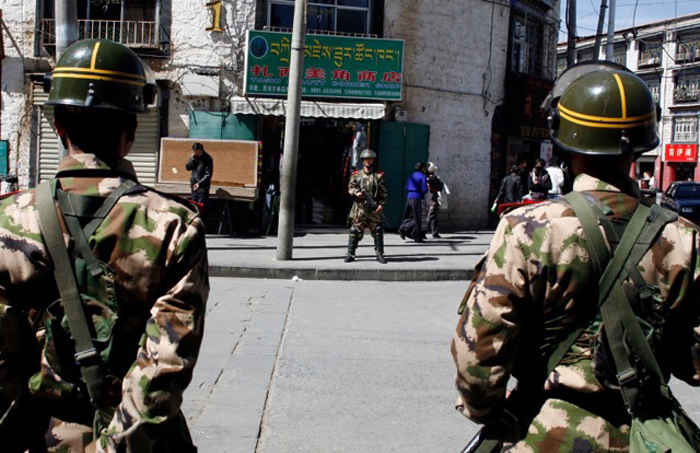 According to a working report made by the head of Tibet’s High People’s Court on Jan 12, TAR dealt with more than 30,000 cases in 2018, including 25 cases involving inciting separatism or financing crimes which jeopardized national security, the report said. It added that a total of 25 people were punished. The report made it clear that no more information on these cases had yet been disclosed. The report also said that investigations were completed of 32 cases in which “some people hyped up topics with the aim of dividing ethnic groups and religious groups”. Besides, TAR was reported to have launched a crackdown on gang crimes, with 360 people in 268 cases being found guilty. Additionally, 55 people in 49 cases were stated to have been punished for involvement in corruption. Because of the extraordinarily tight control on people’s freedom and communication channels, it remains most difficult to get information about any of the cases.